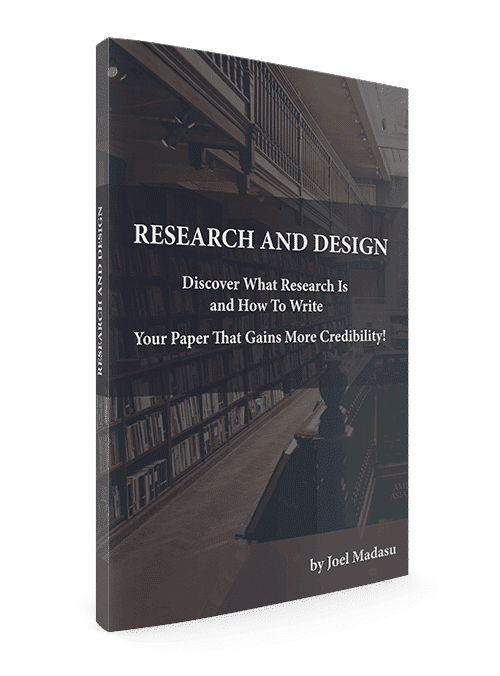 Discover What Research Is and How To Write Your Paper That Gains More Credibility! Note: This Course is in the Process of Completion. Please sign up below to get a notification when it is ready! NOTE: This course is for students who are in Seminary, Graduate School, and/or Ph.D. program. Though the undergrad students may benefit from the material, most of the material is intended for graduate students in preparing them for writing their thesis or dissertation. I will guide you step by step from the first chapter to the last chapter through this course. I will give you valuable information and help you meet the requirements for every chapter and sections of the chapters. You will learn about various research methods such as Applied Research, Basic Research, Historical Research, Scientific Research, Descriptive Method of Research etc. Quality is important, not quantity. This course will help you stay focused on the quality rather than the quantity, which will help your paper gain more credibility. Content should be given priority. YOU should enroll in this course because it is designed to be simple and understandable and help you achieve the results of a graduate level paper! Tell them how many lessons are in the course, how long they can access them, etc. Are you offering worksheets, PDF summaries, checklists, homework, audio files,... Make sure to talk about it! Use icons to symbolize your offer. The image should help to understand immediately what they'll get. What if you do not like this course or this course is not intended for you? No worries! You will receive the refund. Simply specify the reason why you do not wish to continue in this course, by clicking here. Once your request is received, your email will be removed from the course and you will not receive any more emails from this course! Don't be Left Behind: Enroll in the Course Today! Sign Up now and get NOTIFIED WHEN THE COURSE IS READY!